MAP’s continuous ploughshare mixer was selected by the Wool.rec company, a waste processing plant in Germany for use in a specially devised process to manage hazardous wastes. Based on the edge of the High-Taunus natural park in Braunfels-Tiefenbach in central Germany, the Wool.rec company has focused its activities on the environment-friendly disposal of waste glass and rock wool, both of which are extremely damaging to health and suspected to cause cancer. According to German federal law, such materials require certified disposal in hazardous waste depots, which generates extremely high costs for the customer. Wool.rec collaborated with the University of Geissen to develop a method by which crushed mineral wool is processed together with clay, water and other secret ingredients into granules. These granules are further processed into bricks adding particular stability and durability to the product. Burnt in a kiln, the glass fibres form a stable compound with the clay. Wool.rec chose a continuous ploughshare mixer by MAP for the production of the granules. 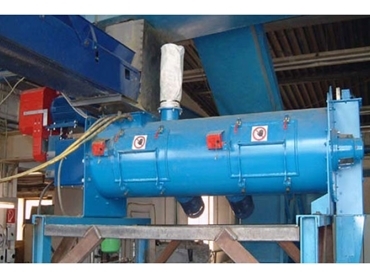 MAP’s WAH-type mixer offers a high degree of homogeneity of the mixture, thus making such a process possible. Reliable two-shift operation is guaranteed thanks to a fluid coupling for soft motor start, as well as the presence of high-speed choppers fitted on the mixer drum. The process has won Wool.rec several awards and approval for new projects in other German states. MAP continuous ploughshare mixers are available from WAM Australia .